The Central District "court" of Simferopol extended the house arrest for Ali Asanov and Mustafa Degermendzhi, the defendants of the so-called "February 26 trial". When considering the extension of the preventive measure, Mustafa Degermendzhi asked the court to allow him to leave the house during the day to help the family after the arrest of his father. "I could at least take my mother to Simferopol: help to carry the food, drive her to the courts," Mustafa Degermendzhi noted. Ali Asanov, who has four children, also asked to change the restrictions of house arrest and give him the opportunity to at least take the children to school and earn a little to support his big family. "Your Honor, where will they go from the Crimea?" One has four children, the other has a grief in the family. Everybody understands that everything will remain the same if the court changes the preventive measure for the signed undertaking not to leave place of residence or personal surety,” one of the lawyers addressed to the jurge. However, Sergei Demenok, the Judge completely ignored the requests of the defendants and left both of them under house arrest until February 7, 2018. More than forty people gathered to support Asanov and Degermendzhi, including Zair Smedlyayev, the Head of Kurultay CEC, Nariman Dzhelyal, Deputy Chairman of the Mejlis of the Crimean Tatar people, and the heads of several district Mejlis. 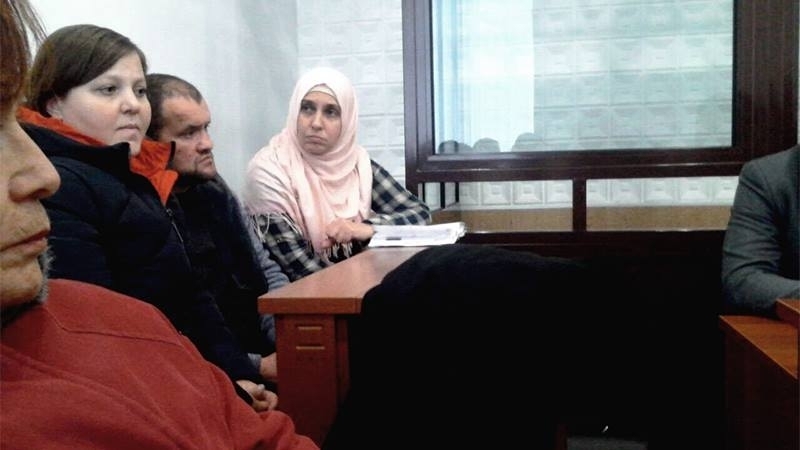 October 23, a regular hearing took place on "26 February trial", where the “court” heard new witnesses in the case. October 12, the "Supreme Court" of the occupied Crimea rejected an appeal against the decision to extend the term of house arrest for Mustafa Degermendzhi and Ali Asanov, involved in the "26 February trial". Reference: Mustafa Degermendzhi and Ali Asanov, involved in the so-called "February 26 case" in the Crimea, are tried for participation in the protest outside the building of the Supreme Council of Crimea in support of the territorial integrity of Ukraine and rendering resistance to the Russian occupation forces on February 26, 2014.